In the middle of the Bulls locker room, between the dressing stalls for Zach LaVine and Denzel Valentine, there's an empty space along the wall about five feet wide. In front of it Saturday night, the Bulls placed a coat rack and several hangars with a chair. It was the "locker" for newcomer Walt Lemon Jr. There just wasn't enough room for another player with all the additions among the injuries and absences. Though with career highs in just about every statistical category and leading the Bulls in scoring in his Bulls debut and first NBA game in the 2018-19 season, Lemon may finally be clearing out a place for himself in the NBA. "I thought Walt, he looked like an NBA player," said Bulls coach Jim Boylen. "He got downhill, he's not scared, he wasn't going to let anyone bully him out, and I like that. I was very excited about his play, his competitiveness and the things he does translate to some of the things we need. He can play through contact and he's locked in already in two days or whatever it's been. I'm thankful he's with us." 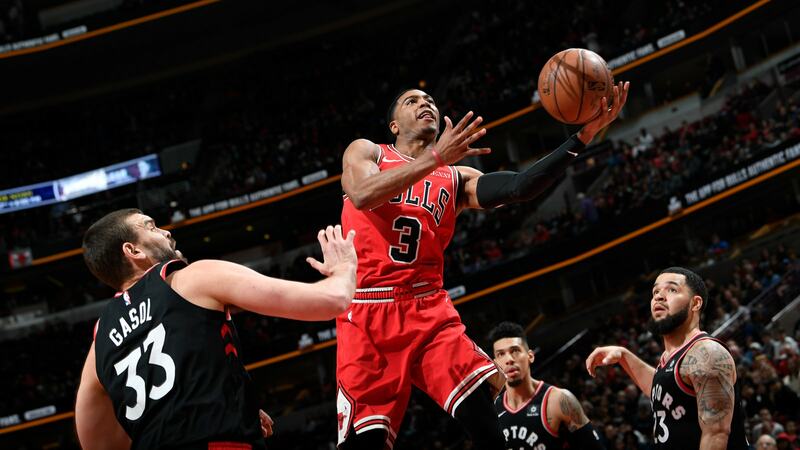 The Bulls with their roster of primarily former G-league players with the injury absences of Zach LaVine, Kris Dunn and Otto Porter Jr. lost to the Toronto Raptors 124-101. 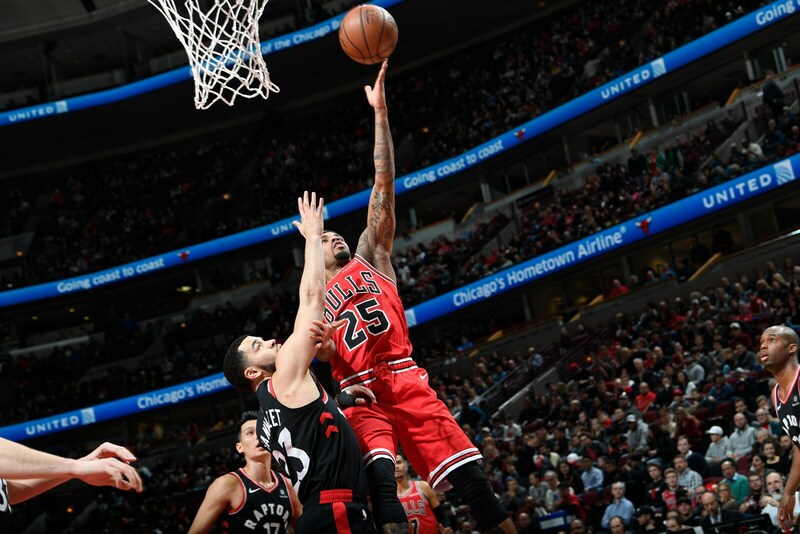 The Bulls, 21-56, played the 54-23 Raptors even for about a quarter and a half before Toronto put a 15-2 run on the Bulls to lead 61-44. The Bulls got within 67-56 at halftime with a rare scoring spurt from Timothe Luwawu-Cabarrot, who finished with a season-high 18 points. But the Raptors quickly regained a 19-point lead three minutes into the third quarter and maintained a significant double digit margin for the rest of the game. But perhaps as welcoming as the play of Chicagoan Lemon, who had 19 points on an assortment of flashy and dashing drives to the basket, six assists, four steals, a block and just one turnover in 31 minutes, was when Toronto mighty mite tough guy Kyle Lowry decided he'd intimidate the 180-pound Lemon at the end of the third quarter. Lowry, a barely six foot fireplug of a player who is one of the NBA's toughest players, gave Lemon a shove walking off as the third quarter ended. Lemon pushed back. Lowry had some words, Lemon came back at him. Kyle Lowry might not have heard of Walt Lemon Jr., but Walt Lemon Jr. came up from the South Side of Chicago, Julian High School and the tough Roseland neighborhood. And no Philly guy was going to push him around. Both received technical fouls, which was a bit more meaningful for Lemon, who is on a prorated NBA minimum contract compared with Lowry's $33 million annual salary. A first technical foul costs $2,000. For Lemon, it's probably 20 percent of his game pay. "Now that I know how much a tech is, I'm definitely not going to say nothing else, I promise you that," Lemon said with a laugh. But he wasn't joking with Lowry and hardly backing away. "I don't think it was that serious; we bumped into each other," Lemon explained. "He pushed me, I pushed him back. We said a couple of words to each other and that was it. I don't think it was that big of a deal. I got my first tech. I'm not proud of that. But that's what comes with it. That's just a moment I had to let people know I'm not going for none of that. "Kyle Lowry is a pro," Lemon added. "He's an All-Star. I respect him. But at the end of the day, I'm a dawg. When I'm on the court, I don't care who you are. I'm not backing down. I respect Kyle Lowry. I'm trying to do what he has done. He's been in the league for I don't know how many years. I'm trying to stick just like he did and get better any way I can, just like he is. But at the end of the day, I'm not backing down from nobody. I don't care if it's Kyle Lowry or whoever. Once we get into those lines, I'm going to go for mine. I don't care who it is." The Bulls may have gotten run over by the Raptors; Lemon was making sure no one was getting stepped on. The Bulls also got 15 points from Shaquille Harrison and 12 points from Antonio Blakeney with Luwawu-Cabarrot getting his first career double/double with a team-high 10 rebounds. Serge Ibaka and Fred VanVleet each with 23 points led Toronto, which played without the resting Kawhi Leonard. But for the Bulls the highlight was the unlikely production and pizzaz from Lemon despite his NBA career of five games on a 10-day contract with New Orleans last year. It's been a basketball odyssey since not being drafted out of Bradley in 2014 that included stops with three G-league teams and four international teams. Lemon carried the Windy City Bulls this season to its first playoffs in its three seasons of existence, but it seemed Lemon's basketball was over with Windy City's playoff loss earlier this week. Then came the surprise call from the Bulls, and Saturday in his first game Lemon was confidently running the team with several highlight crossover drives and impressive finishes at the basket, huzzahs from teammates like LaVine, who tweeted about Lemon's athletic excellence, and an inability by one of the league's better defensive teams to thwart Lemon's play. Plus, Lemon was entertaining to watch, pushing the ball quickly up court and moving the ball around with slick interior passing. Toronto took its shots, bouncing Lemon around and knocking him down several times, the officials looking on in wonder as well. Wondering if he'd get up and continue to attack. Everyone gets tested by everyone when they come into the NBA. Lemon never soured. "At this level, these guys are stronger, bigger, more athletic," Lemon agreed. "You can't go in there without expecting to get hit a couple of times. But that's what the weight room is for. If I'm going to go down there, I've got to prepare for the consequences." Just going to work, though it's hardly the typical environment. Lemon admits he was nervous stepping into his dream, playing in the United Center, for his hometown team, wearing No. 25 to honor his playing idol, Derrick Rose, and Simeon legend Ben Wilson. But especially his mother, Katrina, who Walt said wore No. 25 when she was a volleyball player at Corliss High School. "My mom was really the first person to take interest in me in basketball," said Walt. "She was the one taking me before school started so I could shoot around. Every day. So 25 is special to me because that's a dedication to my mom. My dad passed when I was 15 and the only thing supporting me was my mom. I heard from a lot of friends saying they were coming, but what matters to me is my mom coming. She tries to play the tough lady, she don't like showing emotions. But I know she's proud and excited and probably cried." And perhaps from Lemon a nod as well to the best No. 25 in Bulls history, who also happened to be a Bradley graduate, Chet Walker. "They can't retire it yet because I don't want to wear any other number," said Lemon. Walt Lemon Jr. did No. 25 proud Saturday that included a plus/minus rating on the court 19 points better than the final result. He was helping making an impact despite the defeat. He entered the game midway through the first quarter — Boylen said he might start Lemon in New York Monday — and missed on a pair of drives, though immediately getting to the free throw line. "I just think he's got that confidence," said Boylen. "When you're not scared of the moment the game's easier for you. I didn't see any fear in his face from the first time he was in the gym two days ago. Nothing, no apprehension, no ‘Do I go here?' I'm saying, ‘We're running this.' He's, ‘I got it.' Give him credit. He's got some things to improve on, but we all do." Lemon admitted he was somewhat overwhelmed in his 10-day contract debut last season, going up against Chicago legend Dwyane Wade to start. "Part of me didn't want to mess up. Part of me was a little emotional because, you know, it's my first time I've got a Bulls jersey on me. And I'm from here. I wanted to play the right way and just really show people who Walt Lemon is. I think I did that for the most part, and I have to keep building on it." - Lemon Jr.
"I'm like, ‘I've got to be aggressive,'" Lemon recalled. "And every time I touched the ball I put my head down and went to the basket. Got it blocked every time. I'm a different player than I was at that time." Talk about turning Lemon into lemonade. He was sweet and went down (the court) smoothy. Lemon had a full court driving score late in the first quarter, and then in the second quarter scored on three drives, one drawing gasps from the crowd with a switch hands finish. He was routinely beating his defender off the dribble, his left his strong hand. It was like with Manu Ginobili: You knew he was strong left handed, but still difficult to stop. Lemon had a nifty cradle and finish in the third quarter. And while his shot is a bit sticky with an unusually high arc, his quickness, athletic ability and passing opened the court. "When I got called up last year, I wasn't used to the pace and athleticism of the NBA. That's something I had to adjust to," Lemon said. "I was nervous, excited (Saturday). Part of me didn't want to mess up. Part of me was a little emotional because, you know, it's my first time I've got a Bulls jersey on me. And I'm from here. I wanted to play the right way and just really show people who Walt Lemon is. I think I did that for the most part, and I have to keep building on it. Inside the Locker Room with Walt Lemon Jr.
"They gave me an opportunity to play because you know most guys who get called up don't get an opportunity to play," Lemon noted. "So it's big for me to continue to make those strides on both ends of the floor and be as complete a player as I can be and show teams, show this team most importantly, that I can help win any way possible. "If you would have told me a couple of days ago that I was going to play 30 minutes against the Raptors — the No. 2 team in the East — on the Bulls' floor, let alone play 30 minutes in an NBA game period, I wouldn't believe you," Lemon beamed. "This is definitely a surreal moment for me. And I'm going to never forget it. I'm going to cherish this moment for the rest of my life." It hasn't been a great season; but it can still produce some great stories.